Another week and another endless list of things I NEED in my life/wardrobe! I saw this shirt in Look magazine the other day and ordered it straight from Asda online. At £18 I expected a cheap feeling fabric but the quality of the shirt is fantastic! A silky material and beautiful shape with it being slightly longer in length than an average shirt. I couldn't wait to put it on so I am wearing it today under my Topshop Boutique Leather Pinafore. Such an easy wear! I plan on wearing it under my denim dungarees and open over a bralet and high waisted jeans. Keep your eyes peeled next week for my how to wear it! I don't usually shop in New Look but wondered in when I was staying with my family this week and saw this jacket in the sale for £15! I have been after a more premium feel varsity jacket and planned on buying the black leather one from Topshop for £65 but at £15 I have saved myself some serious pennies! The jacket is amazing quality and has faux leather sleeves which makes it feel more grown up. I love wearing it with a floaty skirt, socks and boots for a college chic look. Check out the blog this weekend for how I wore my new Varsity jacket. Miss Guided has some fantastic product at the moment & I have seen these runner shorts recently on lot's of blogs and in magazines. They are fantastic for adding a sport luxe feel to any outfit and still feel premium with the faux leather material. They can be dressed down with a jumper, varsity jacket, beanie and boots or dressed up with a heeled boot, silky top and blazer. A definite must have for this season! I adore what D&G have done with their recent collection. The gorgeous soldier prints they have used on matching 2 pieces and dressed and the pom pom earrings which have a nordic feel to them, I have seen some copies of these coming through on the high street which I will blog about when I see. I might even be tempted to make my own! I love anything heavily printed with a indian or african influence. This crop top with elephants printed on it is so original and handmade. Perfect for this summer's Safari trend and think it would look perfect for holiday teamed with some high waisted shorts and tribal jewellery. Daisies are hot on everything this summer and I absolutely adore this handmade black crop top which has a daisy chain round the neck and frill bottom. Think it would look gorgeous with a white sleeveless shirt underneath and a high waisted jean. A very talented fellow Topshop Creative makes these so be sure to check her out on ASOS Marketplace just search nakedpreacher. Aren't these rich prints absolutely stunning! I would love a pair or each print but at £75 they don't come cheap. They are absolutely perfect for the festival season and the pom poms add a really bohemian feel to them. I can't wait to rock these with a hat, sunnies, boots and a fringed kimono this summer! 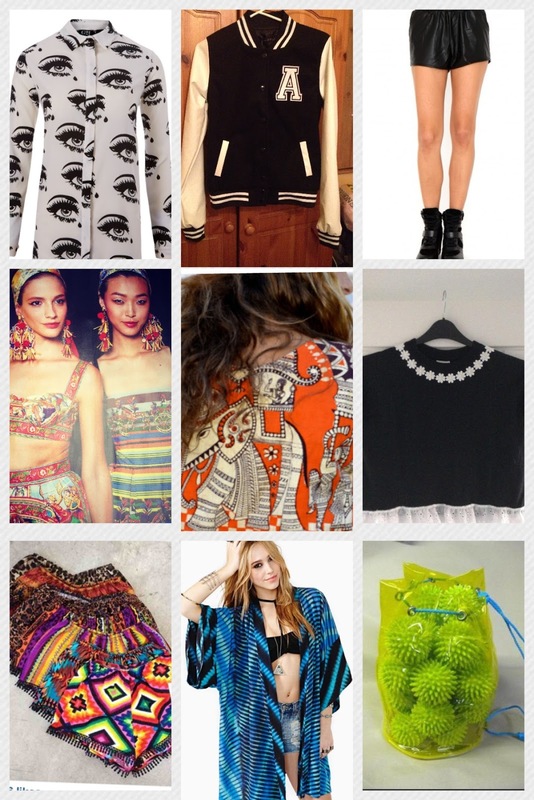 If you haven't checked out the vintage section on nastygal.com then you are seriously missing out! The vintage gems are pricey but they handpick the best of the best and have some really stunning pieces including this gorgeous Kimono which I haven't stopped thinking about for days. at £110 it's expensive but for a statement vintage piece like this I think its worth every penny. Kimonos are perfect for going out in England. I tend to wear a short and crop top/bralet/leotard when I go out and this would be perfect to throw on over the top to keep me warm but not ruin my outfit. Would look fab on the beach over a bikini. It's a gorgeous piece and would look great layered up with lots of jewellery. After my latest obsession with my transparent clutch bag I saw American Apparel have a transparent backpack which is amazing, but priced at £50 I wanted to find an alternative. I love Ebay and exactly for this reason. I searched transparent bag and this gym bag come up for £2! Obviously I won't be using it for gym equipment like above (if any of you were thinking what the hell is that!) It's an absolute bargain and bang on trend for this summers transparent accessory trend. This neon yellow plays a big part in my wardrobe at the moment. I can't wait to wear it with my matching yellow beanie, metallic silver jumper and runner shorts for an ultimate premium sports luxe outfit. One can find the fact that products different types of pieces on the market. Yow will discover any sort of panerai replica sale see in the majority of earrings retail outlets, with an item effortless together with low priced, that will an item attractive together with trendy. Most of the much less expensive pieces that can be purchased happen to be associated with a truthful superior together with is not going to denigrate with higher end pieces. Quite possibly baby's pieces in the present day range during superior together with outlay of money. One can find that a number of baby's pieces are based on certain scenario or simply video clip which is a come to for the fact that special point in time. A good Mary 10 or simply hublot replica sale see can possibly get purchased meant for around what is important to pay money for a, effortless however , beautiful woman's see having hardly any famous well-known. Well-known pieces comprise Estimate pieces, Fossil pieces, Calvin Klein pieces, Armani pieces together with Eliza Kors pieces. Pieces the fact that come during the category of attractive together with reasonable happen to be estimate see. One can find many izes and shapes that will be most of attractive together with IWC replica sale suited to a lot of personas. Whenever you are researching for an item brilliant however , handy, or simply an item beautiful together with amazing consequently Estimate stands out as the collection you might want to investigation. They need terrific pieces meant for gents together with gal and certain to accomodate kids.